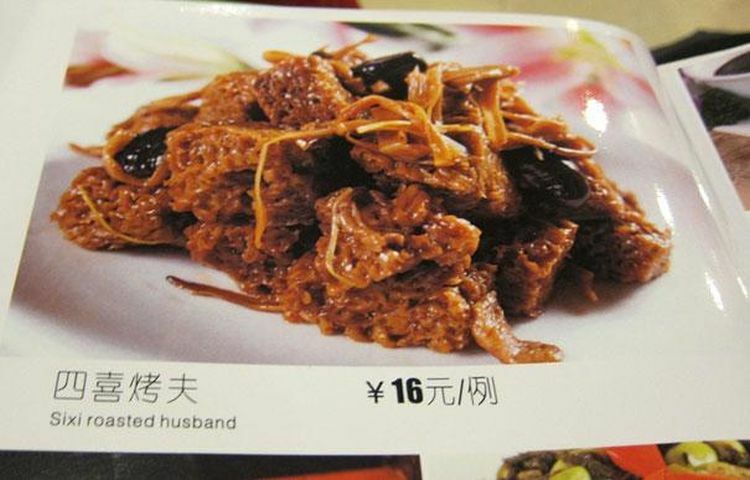 Language Log » How about some delicious roasted husband, dear? Source: "40 Most Bloodcurdling Chinese Mistranslations Ever! Warning: You Will Laugh To Death! ", Seenox, 15th item; I've covered about half of these items on Language Log before. This magnificent time wasting compilation is mentioned by Geoff Pullum in "Mandarin Myths", The Chronicle of Higher Education (7/8/14). "Sixi roasted husband" is also mentioned here: "Tired of bad English tarnishing its image, China has new translation guidelines for signs", by Echo Huang (6/23/17), which links to this Weibo post. "dried (shiitake) mushrooms, dried tiger lily buds, fresh bamboo shoots, wood ear fungi"
Other similar ingredients could be substituted to make up the "four joys". Do not confuse this "four joys kǎofū 烤夫" dish with sìxǐ wánzi 四喜丸子 ("four joys meatballs"), which consists of four meatballs in gravy. Now it's time to figure out what kǎofū 烤夫 really means. First let's get the orthography down. The full form of the term is 烤麩 (simplified 烤麸). People probably found the semantophore of the second character to be troublesome and time-consuming to write, so they just wrote 夫 for the sound. Unfortunately, one of the many meanings of 夫 is "husband", which is where the "roasted husband" comes in. If we add kǎo 烤 ("roasted") to fū 麩, we get kǎofū 烤麩, which is “a spongy variety of fried wheat gluten used in Chinese cuisine”. Language Log readers will recall our recent post on "Seitan" (12/21/18), which is about a similar wheat-based foodstuff. Such are the folkways surrounding characters and food in China. I'd say the "Maryland head" is no less disturbing. If you can get scrod in Boston, you can get head in Baltimore! I love kaofu. The restaurant where I get it gives the name in English as Kaofu (wheat gluten).